The Pittsburgh Penguins have signed forward Bryan Rust to a two-year entry-level contract, it was announced today by executive Vice President and general manager Ray Shero. The contract will begin with the 2014-15 season and run through the 2015-16 campaign. 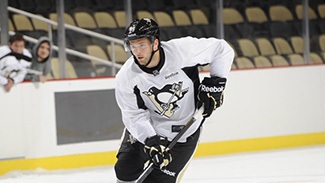 Rust, 21, the Penguins’ third-round (80th overall) draft pick in 2010, played the past four seasons collegiately at the University of Notre Dame. As a senior, Rust tallied a career-high 17 goals while adding 16 assists for 33 points, helping to lead the Fighting Irish into the NCAA Tournament while serving as one of the team’s alternate captains. Last year, the 6-foot, 191-pound Rust helped Notre Dame win the CCHA regular-season title by establishing career highs in assists (19), points (34) and plus-minus (+25) in 41 games played. His 19 assists led the team. In four years at Notre Dame, Rust finished with 43 goals, 54 assists and 97 points in 161 career contests. A native of Pontiac, Michigan, Rust played two seasons with the United States National Team Development Program (NTDP) from 2008-10, suiting up with the Under-17 squad his first year and the U-18 Team the following campaign. Rust helped the Americans earn a gold medal at the 2010 Under-18 World Championships in Belarus by registering eight points (4G-4A) in seven contests.